The Current Draw of the PDF-2 is about 30mA. It works off a 2.1mm centre negative (Boss Style) adaptor. If using battery we recommend using a lithium 9v battery as Alkaline are unstable. Power supplies should be fully Isolated. The PDF-2 and its unique parametric distortion filter is a completely new look on what a drive pedal should be. Featuring an ultra-sculptable parametric EQ and a foot-switchable clean and dirty channel, players are able to conjure everything from smooth overdrive tones to wild and ferocious distorted tones and all the way to cocked wah and completely unapologetically filtered sounds. Now add in on-the-fly tone sculpting or foot-controlled phaser and wah sounds via the optional Stone Deaf EP-1 expression pedal and you’re in for quite the super-sonic ride! 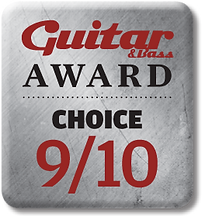 The very popular PDF-1 was Stone Deaf’s first product and has been used by infamous guitarists such as Josh Homme, Nick Valensi and many others. As the younger brother and the successor to the original pedal, the PDF-2 improves on the design with a reduced noise floor, adjustable gain knob and a dual foot-switch for clean and dirty channels. 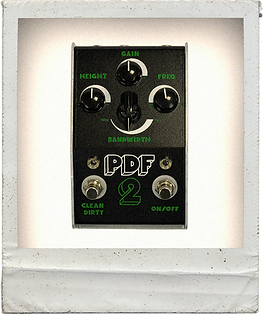 PDF-2 is one hell of a versatile pedal that’s applicable to many instruments. From Electric Piano, Bass, Drums and Synths, to Electric and Acoustic Guitars, this little beast of a circuit has proven itself as one of the most useful pedal based EQ, Boost and Distortion devices on the market. Add a Stone Deaf EP-1 active expression pedal to the expression input control and on top of the impressive regular tone shaping features, PDF-2 can also be used for wah, phaser and manual tonal shifts to give you even more tonal creativity. The expression input will only work with Stone Deaf EP-1 active expression pedal. Used by many professionals on tour, PDF-2 has proved to be a rugged design due to the pedal’s high quality construction. Each PDF-2 is proudly manufactured by Stone Deaf in our factory based in Huddersfield, West Yorkshire, England.